To modify your genre preferences, access your profile page via SCISWeb, and select the ‘Advanced options’ tab. Here, you have the option to keep genre headings in the 650 field, or select the ‘Genre/Form’ heading 655. Please note that changes made to your SCISWeb Profile will not affect SCIS records imported directly into your library management system via Z39.50. 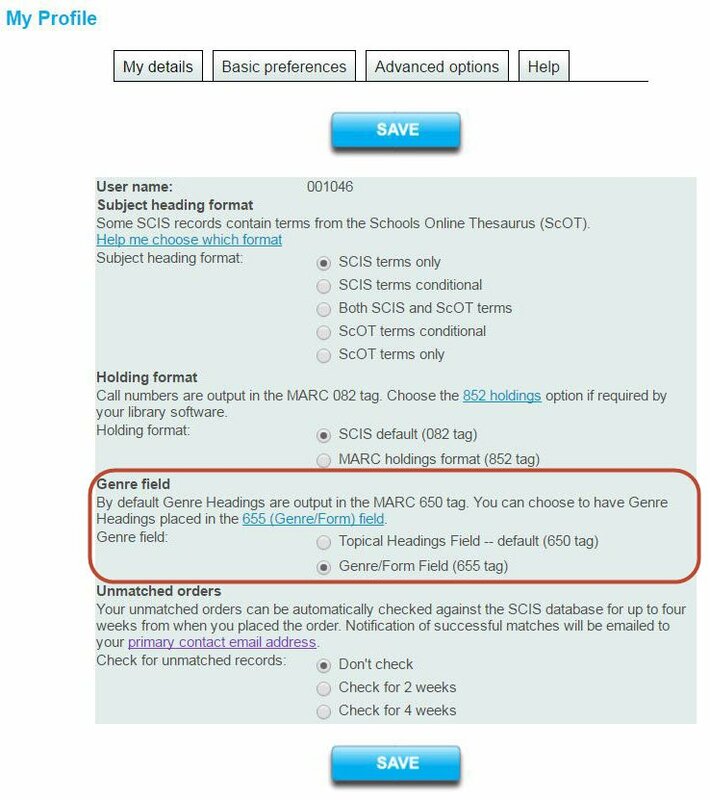 That means genre headings will remain in the 650 ‘Topical Term’ field in all records downloaded from within your LMS. Want to read more about genre shelving? The National Library of New Zealand’s Services to Schools have put together a great resource for school library staff interested in genrefying their fiction collection. If you have any questions about this update, please send an email to scisinfo@esa.edu.au. Hi Cora, Thank you for your enquiry. You can find a list of headings that SCISSHL identifies as genre headings in this document: http://www2.curriculum.edu.au/verve/_resources/rreckoner.pdf (see point 2). Please let us know if you have any further questions about this update. Regards, Nicole.